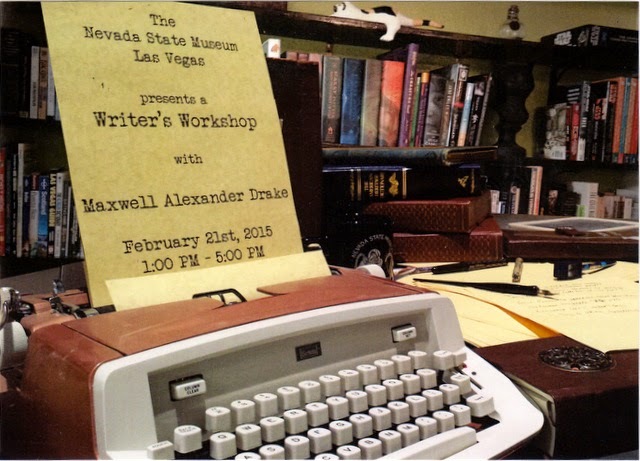 Postcard US-3223060 to Germany was an advertising card for a Writer's Workshop presented by Maxwell Alexander Drake, an award-winning Sci-Fi/Fantasy author, at the Nevada State Museum in Las Vegas on February 21, 2015 from 1:00 p.m. to 5:00 p.m.
Maxwell is teaching free writing classes hosted by the Clark County Library District. His next classes "Character Creation – Who is that masked man anyway?" are scheduled at Centennial Hills Library on Sunday March 1, 2015 at 3:00 p.m. and Monday March 2, 2015 at 8:00 p.m.